Had my fingers crossed for something like tkmaxx but that’s alright. And how will Bell Green cope with all the traffic? It is frequently jammed up now and you can actually taste the air pollution around the junctions.Aldi are saying there wil lbe another 3000 rtn journeys a day and they have a vested interest in estimating that on the low side. And there is always hundreds of spaces, am I missing something? Granted I do not live beside it so apologises. Will be great not to have to go into the massively congested Catford! No one cares if htere are parking spaces or not; the issue is the road congestion o nthe gyratory system and its feeder roads- Southend Lane, Perry Rise and Perry Hill… The council itself state the system is above capacity from their own data. I suppose if it’s decided (by the council?) that bell green is to exist as retail park then perhaps we might expect some shops people actually want to go to setting up and for those people to be happy about it. The comment on parking spaces was a general comment but actually how can there be so much congestion but no-one actually in bell green parked?! I wonder if the congestion is just bad traffic management system which may outside of Aldi’s control. Sorry if it’s a different experience for you. How does everyone feel about their new local supermarket? Presumably there may be objections put in…or is it too late for that now? I don’t think objections are possible, as it is already a retail store. We might try asking to have a bit more ecological awareness on the management of the delivery bay area, and wildlife enhancement behind the fencing, but that’s about all. Except for a serious look at the light pollution conditions which I gather the whole retail park is flouting. Basically, hold them to every one of the rules already in place. I have a great concern about the pollution, but we need a local plan to start tackling that, so please talk to your councillors about it. I wonder whether increasing the dwell-time for visitors by including leisure - children’s soft play etc, might reduce the proportion of pit-stop shoppers? Basically, get shoppers to spend more time and money there, and get more community benefit from each car journey… That can only work if the estate is willing to improve the visit experience, and make it slightly less grim. Does anyone have an ETA for the opening? Sad to see yet another multinational setting up in Sydenham but this is life as people just consume and don’t think about where it comes from/ quality of produce and the effect the logistics has on the environment. This forum should be about promoting local business. So lets start threads promoting where people can find alternatives. Where do we all get our meat and veg from that isn’t a large multinational? What are the good shops and markets and butchers that we recommend and is there much of a price difference. For me this is just another supermarket I will not be going to. Maybe admin can start threads on local businesses to help break people out of the routine of just going to the big shops for sub-par produce? I manage to do nearly all my shopping at Billings, PFC and the small veg shops nearby or the weekend markets and its actually cheaper for some items but the quality is way ahead of what the supermarkets have. The Sausage shop (Beckenham) - sausages, what else?! Maybe admin can start threads on local businesses to help break people out of the routine of just going to the big shops for sub-par produce? Hi Cormac, I heartily agree on starting threads for local businesses like Billings - in fact there already is a topic for Billings. Please do start topics talking about your favourite independents and we will promote widely on social media. Getting back to Aldi (apologies for the slight tangent!) I always think it has a lot more choice than Lidl and some great own brand stuff (particular the stuff angled towards the healthier crowd - eg: their version of whole earth peanut butter, healthy snack bars and “crisps” etc). Only problem is anytime I used to opt to shop at an Aldi instead of Lidl I’d always buy/spend way more because of all the different stuff! I live just behind the retail park. I’m glad about an Aldi personally. Normally I shop at Lidl but have to grab bits from Sainsbury’s because Lidl’s around here aren’t very big - it costs me a lot! 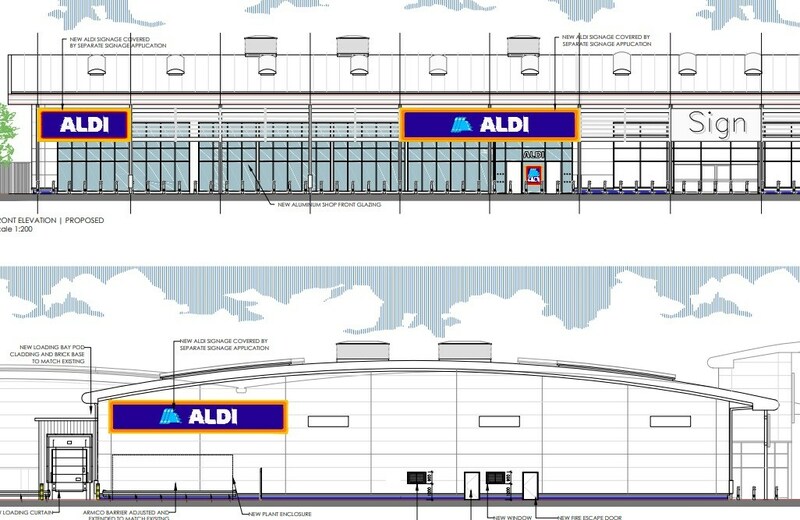 An Aldi superstore will save me, & I’m sure others, a bit of cash. Also never really have a problem with the traffic around there. Usually only sit there for one run of the traffic lights which really isn’t that bad. Especially compared to the Catford bridge travesty down the road. Unfortunately, it is not necessarily queues that is the issue. It’s the pollution. Also trying to cross the road. But we shall how the roads cope at weekends. I also live nearby. But I generally always walk to the shops, as it’s quite close and I can carry things in a rucksack and bags. Of course, this probably means more, smaller shop trips. They’ve gutted the place and it looks huge.